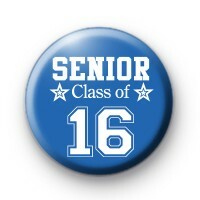 This is a 1 inch button badge in a bright blue with the words Senior Class of 16 in bold white font. This is for anyone graduating from School, University, College - any academic environment. Its a lovely keepsake for teachers to give their students at the end of the year.